There were many wonderful things in Connie’s life including Rilla, his wife of 53 years, and their three children. The list also included the Model A Ford that the newly married Weinzapfels took on thier honeymoon and which Connie eventually was able to restore. Connie was also very pleased by his long service as the chairman of the health, sanitation and safety committee of the Arizona Legislative Board of Railway Brotherhoods. He was justifiably proud of his accomplishments on the board, including working to obtain large settlements for the families of railroad employees killed on the job. But Connie was best known as a train engineer. He loved steam engines and said of them, “(A steam engine) is a living thing. It talks to you and everything. It was alive. It was hot as a firecracker.” Diesel engines, he thought, were “dead”. Following in his father’s railroading footsteps, Connie began working for the Southern Pacific Company in 1937. He started as a fireman and was promoted to engineer during World War II. He would hold that job until he retired on Thanksgiving Day, 1987, a fifty year SP employee. 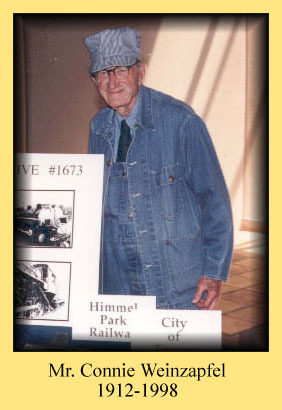 After he retired, Connie became a founding member of the Historic Locomotive #1673 Task Force. His knowledge and experience were invaluable to the group in its efforts to restore the engine. Whenever the Task Force held an event at the engine in Himmel Park, Connie would talk about his time operating steam engines, his eyes bright with memories. For a few months in the late 1940’s, Connie had actually operated #1673 on a freight route south from Benson, Arizona. Six days of the week he would take the train, loaded with items such as cattle, foodstuffs, and feed for cavalry horses then located at Fort Huachuca, Arizona, on its 16 hour round trip. Many years later, Connie’s last train ride would also start and stop in Benson. It was aboard the tourist train which runs along the San Pedro River. On a bright, warm October afternoon, Connie had a broad smile on hs face as the train moved along. Connie Weinzapfel died on March 19, 1998. It was a fitting date, one day before the 118th anniversary of the arrival of the first steam engine into Tucson. Connie would have thought the timing was wonderful.